This weekend I was going to be good and productive. Work on some technical writing, workout, do some science fiction writing. Then I looked at my bin of dolls and nope. I played with dolls well into high school. I picked it up again a couple of years ago and discovered, yup, it’s still fun. As a decided introvert, there’s something about the dolls that lets you be maniacal and crazy, just a little. 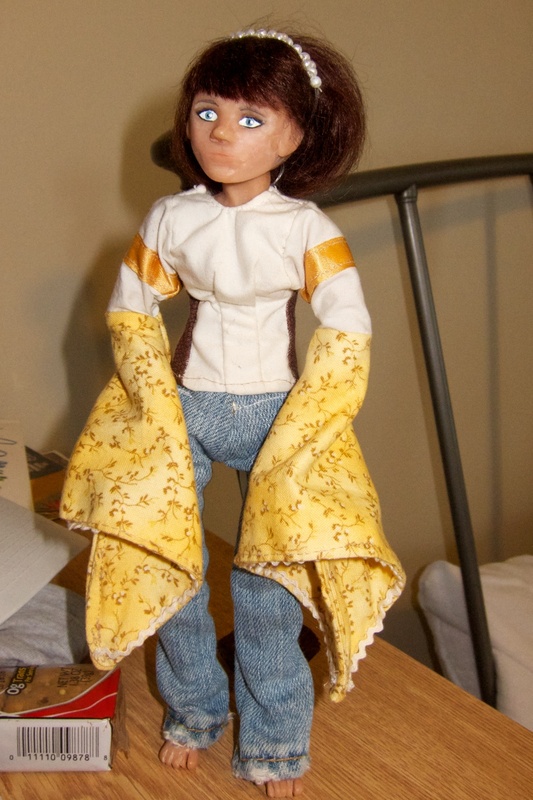 When I picked the habit back up, I decided to try something I hadn’t as a kid: make a doll. I found this tutorial about making ball-jointed dolls. It took forever, but I made Calliope, shown below. By no pre-planning, she ended up almost exactly barbie sized (1/6 scale). I made everything shown below but the wig. She has two left feet (literally, oops), and is a bit gangly, but I still love to play with her. Sometimes it’s tempting to feel like it is a waste of time to do things like play with dolls. Doubtless many would agree with that statement. I think this kind of play has been an invaluable resource for my writing projects, especially the kid oriented ones. And still, it’s just fun. And fun is as important as productivity. This entry was posted in Contemplation and tagged ball-jointed doll, BJD, doll, fun, playing with dolls, relaxation on January 14, 2013 by Vironevaeh.